Munchie’s attention span is about the length of an elfin pinkie toe. Reading a book from cover to cover is a nearly impossible feat. Starting a book and not getting to the end crushes my soul… and often, I find myself scurrying back over to the book, after Munchie has fallen asleep, to get to the end. A couple weeks ago, at one of our story times, the group leader said we should feel comfortable skipping pages in longer books. She even said that we could just go from page to page, describing pictures. Um… in the words of Peggy Hill… Escuchame?!?!? I have started skipping pages in longer books… which allows Munchie to get a taste of the beginning, middle, and end. 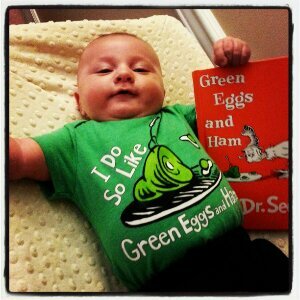 I admit, sometimes I still have some trouble wrapping my head around the concept… and sometimes I do sneak back to read the entire book on my own while Munchie is napping… but this reading style that I once dubbed lazy and half-“donkey”ed is kind of working out for us. In fact, I kind of like being able to (kind of) get through a book with Munchie. Get the shorter, smaller Dr Seuss board books. His regular books are way too long, esp for wee little kids. As my daughter got older I knew the books by heart & could truly read the book with my eyes shut tight! I tried to skip pages, esp as she started to fall asleep, but she’d always catch me & make me go back dang it! Damn those smart kids… can’t ever pull one over on them. I started reading the shorter books… seems to be helping… also, attention span has significantly increased in the last month.